As the masterminds put it, the Los Angeles Podcast Festival is “a celebration of podcasts, podcasters, and most importantly, of the fan. Especially the fan who likes to spend money.” But maybe you don’t have to worry about the money part, because The A.V. 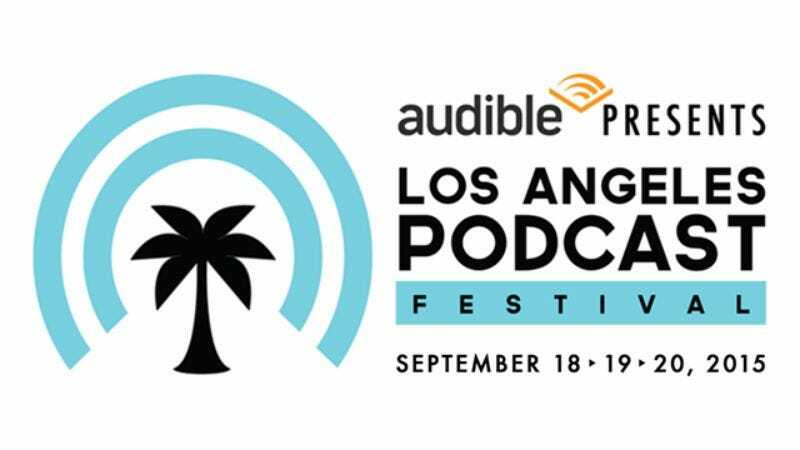 Club is giving away two sets of weekend passes to the 2015 Los Angeles Podcast Festival presented by Audible. All you have to do is tweet who you’re excited to see using the hashtag #AudibleLAPodfest. Winners will be contacted by this Wednesday, with the festival taking place September 18 through September 20 at the Sofitel Hotel in Beverly Hills. In addition to live podcasts and a huge standup show, you will also have the chance to catch the preview of Comedy Film Nerds Graham Elwood and Chris Mancini’s documentary Ear Buds. Here’s a full schedule of events, and to get updates on guest bookings, fans should follow the festival on Twitter.